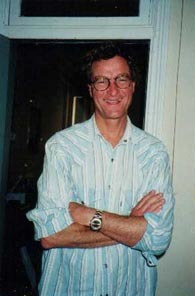 Peter Mackie has been a working musician since 1976. 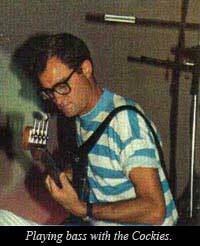 His most successful period as a player was when he performed bass guitar duties with the Cockroaches. 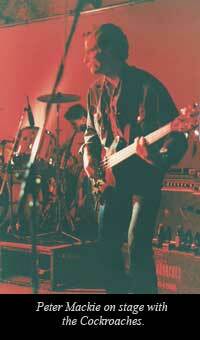 Peter replaced Phil Robinson as their bass player in 1987. The Cockroaches were signed to Regular Records and, along with the brothers Tony, Paul and John Field and drummer Tony Henry, Peter recorded the band’s second album, Fingertips at Trafalgar Studios in 1988. The Cockroaches undertook several long and successful national tours during this period and at one stage they were described by Rolling Stone as the hardest working band in Australia. The band’s third album Positive, which was produced by the legendary Mark Moffatt in 1991, included a cover of Brenda Lee's ‘Here Comes the Feeling’ which also appeared on the soundtrack to the feature film The Crossing, starring Russell Crowe. The band continued to record radio friendly singles and albums such as St Patrick’s Day 10am and a collection of hits was released in 1999. 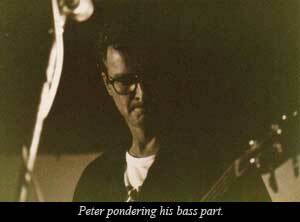 Peter had left the band by 1997. He is cited in the Australian Who’s Who of Rock (4th ed., 2002). 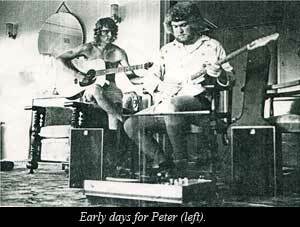 After leaving the Cockroaches Peter struck out on his own recording three solo albums of all original songs. These recordings were made with the help of many of the musicians he worked with over the years and he is in the throes of preproduction for his next collection of songs. He continues to play with many of his compatriots, including Jim Conway, John Field’s band and wherever and whenever he can he is to be seen with any number of musicians playing regularly in Newcastle and Sydney. He also plays recording dates whenever he is available. Peter is also a fully paid up member of The Café at the Gates of Salvation, an acapella choir from Sydney that has had significant national recognition. 2006 Peter Mackie The Spinning Man (prod. Peter Mackie) Independent. 2003 Peter Mackie Late Starter (prod. Phil McIntyre) Neanderthal Productions. 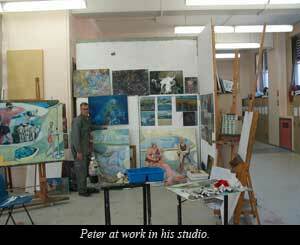 Peter has had an intense and long-lasting love affair with painting which he has pursued alongside his musical career. He has staged at least fifteen exhibitions of his work over the years as well as travelling to Greece and France to pursue the muse for many of his paintings. 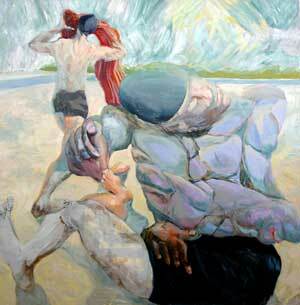 Peter’s artwork encompasses landscape, still life, portraits and some figurative studies. His exhibitions have been primarily solo ones with the most recent being staged at Newcastle Art Space in February of 2006. 2006 Solo Exhibition, Newcastle Art Space. 2001-3 Student Exhibitions, Advanced Diploma in Fine Art, Meadowbank TAFE. 2002 Group Exhibition, Chrissie Cotter Gallery, Sydney. 2002 Group Exhibition, TAP Gallery, Sydney. 2001 Group Exhibition, TAP Gallery, Sydney. 2001 Duo Exhibition with Dot Kolentsis, ceramicist, Kulture Shop, Bronte. 2000 Group Exhibition, Cafe/Gallery, Annandale. 1995-2000 Solo and Group Exhibitions x 5, Cafe/Gallery, Annandale. Media Release - Newcastle Art Space, 2006. Peter Mackie is no stranger to creative journeys. He spent ten years touring across the wildly varied landscapes of this continent with one of the hardest working bands in the country, The Cockroaches. After the band called it a day Peter threw himself into his new life. Since then he has been a long term member of the acapella group Café at the Gates of Salvation, and he’s recorded three independent CD releases of his own songs. Not one to rest on his laurels Mackie has continued his creative odyssey by studying art at the Sydney Gallery School in Meadowbank. He specialised in painting and staged a number of exhibitions of his work in galleries in Sydney. Mackie was lucky to study with Matthew Tome, who is now Head of Fine Art at the Hunter Institute in Newcastle. Not content with these representations Mackie recently indulged his passion for vistas of all types, and his sense of history, by taking a lengthy trip through the Greek Isles where he occupied his time sketching the islands and the locations he had read so much about. “Greece was fanstastic, if tiring. I walked all over the place and came home with some drawings I was really happy with. I’d also spent some time in France a few years ago and filled a number of pads with sketches of the places I’d seen which was really quite rewarding. I worked on a small family vineyard in the South of France and really got the earth rubbed into my soul. That proved useful for what I wanted to do with this exhibition so some of that European sensibility might have surfaced in my work.